Last Friday, I was all set to give a Khutba about the need for Muslims to plan ahead on an individual and community level. My notes were ready and I was in full “Khutba mode”. But before sermon time, I decided to change the topic completely — to talk about the exclusion of Muslim women from the mosque and community life. It wasn’t an earth-shattering event that made me change the topic. It was an email. And it proved to be the proverbial straw that broke the camel’s back. It was one of five emails I received last week about Islamic events with a clear “brothers only” statement. One notice for a regional conference even stated categorically that there was no space for women and children under 15 at the event. But the emails were only part of the story. A week before, I had given a Khutba in another, brand-new mosque in the heart of Chicago. After the prayer, while in the elevator, I overheard four Muslim sisters speaking angrily about their experience in the Masjid. “If I wanted to watch TV, I’d stay home,” said one of the women, disgusted. I asked them what was wrong, and they told me how they could only see the Imam through a TV system set up in the women’s section. Moreover, the space was inconvenient, uncomfortable and was changed twice that day. This was despite the fact that months ago, the leadership of this mosque had promised me that they would involve sisters in decision-making about how the women’s space would be set up. Who decides how women’s space in the mosque is allocated and organized? How many women sit on the Board of Directors of our mosques? If women are part of the Board of Directors, are they elected, chosen by women, selected by both men and women or are they simply the wives of male board members? I also reminded the audience that in the Prophet’s mosque, women could hear and see the Prophet Muhammad, peace and blessings are upon him, and later, the leaders of the Muslims (Khulafa) when they spoke from the pulpit. Actually there are reports of interaction with the Prophet when women raised questions. Caliph Omar even went back to give another sermon to withdraw his opinion when a women from the audience gave him critical feedback after his Khutba. Moreover, when the Prophet felt that the women were too far away to hear or he had specific points to make, he would walk over to their section and present a Khutba for them. Women in early Islamic history were active not just as “mothers and wives” but contributed as individual Muslim women in all aspects of the community. On a scholarly level, there was Aisha, may God be pleased with her. She is credited with disseminating the knowledge of Islam and information about almost all aspects of Islamic life. Today, nearly half of the Islamic jurisprudence of the Hanafi school of thought (which is followed by about 70 percent of the Muslim world) comes through the students of Aisha alone. On a political level, there was Umm Salama. During the signing of the Treaty of Hudaibiya, when none of the Muslim men agreed to forego Hajj due to the demands of the pagan Meccans, the Prophet consulted Umm Salama. Her advice to him was to perform the rituals indicating that they would not be performing the pilgrimage, and the Muslims would follow. He heeded her advice, and as she suggested, the Muslims accepted this. After the death of the Prophet, one major issue was how to preserve the authenticity of the Quran. Although the Quran had always been committed to memory and writing, the written pages were scattered. When a master copy was put together at the time of the first Khalifa, Abu Bakr, that copy was not kept with him or any other Muslim man. It was kept with a woman — Hafsa (may God be pleased with her). Finally, in Madina during the leadership of Omar (may God be pleased with him) Al Shifa Bint Abdullah was made in charge of trade and commerce in the city. These are just a few examples of the dynamic role women played in early Islamic history. But they are of no use if the inclusion of Muslim women in the mosque and community is reflected only in theory. While sisters are a full part of the community, many mosques are run as though Islam is just for men. This is evident by looking at women’s spaces, their decoration, their uncomfortable size and design, the absence of women from the Board of Directors of most mosques and the relegation of their activism and ideas to a “women’s committee”. Muslim women in North America are as professional as Muslim men and contribute as generously. I remember fundraising in a New Jersey Masjid. Five Muslim women contributed $25,000 each within the first 12 minutes. It inspired me to ask the audience: is there a man who can match these donations? “I will deny no man or woman among you the reward of their labors. You are the offspring of one another.” (Quran 3:195). Normally, two or three people will approach me after a Khutba to thank and compliment me for it. This time, ten times more people came over, appreciating what I had said, Alhamdu lillah. That’s one of the most positive instances of feedback I’ve ever gotten in years of giving Khutbas! Although I have yet to hear the response from the leadership of the Masjid, this gives me hope that the community is ready for change. A few board members also spoke very positively about the points I raised, including one of the founding members. The question is, who is stopping the change? In Chicago, I estimate that in about ten percent of the Friday prayer locations, there is proper space for sisters’ participation. In these places men and women are in the same location without a curtain or wall separating them. In terms of the remaining 80 percent of mosques that do have a space for women, these are often cramped and inconvenient. By inconvenient, I mean that women cannot see the Imam or do not know what is happening in the congregational prayer. 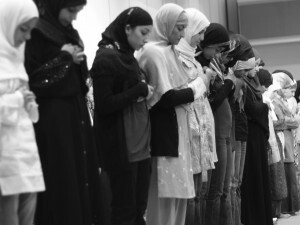 In about 10 percent of the Chicago-area mosques there are no spaces for women. One Muslim sister in the city related to me her experience after visiting one of the largest mosques in Chicago that had an inconvenient room for women. When she entered the women’s area, a group of sisters was standing in line, thinking prayer had started because the recitation of the Quran could be heard. Taking Quran recitation as a cue for congregational prayer, the sister joined the others in line. After several minutes, when the man ended his recitation without calling for the next step of prayer, Ruku, the women learned that it was not a prayer. Needless to say, the women were humiliated and upset about this confusing situation. This is just an example of the practical problems this segregation in prayer places causes. An additional problem in mosques where women cannot see the Imam is the fact that the noise level often becomes unacceptable. This tends to be because most men dump the responsibility for taking care of their active children on their wives when they go to the men’s section of mosque. Also, since women can’t see what’s going on, they end up talking to each other. This leads to the Imam asking women to “be quiet please,” furthering tension and exclusion. When women are out of sight, it’s also more likely that they will be out of mind. That means their discourse and participation are ignored on a Masjid and community level. Moreover, few women have easy access to the Imam, which worsens the problem, since the Imam is the one man who can make a significant difference in bringing women’s issues and problems to the attention of other Muslim men in the community. This perhaps explains why you don’t normally hear many Khutbas on women’s challenges here in America or abroad. The situation becomes worse when non- Muslims visit. They see there are hardly any women present in the mosque. Or, if there are a few, they are confined to a small and less ceremonious corner. What kind of Dawa is this? What kind of impression does this give in our current context, where the battle against stereotypes is ten times harder than it was pre-9/11 America? This visual impact is far greater and far more lasting then tens of books lauding the status of women in Islam. Since Shahadah (witnessing) is the first pillar of Islam, this obstacle to outreach must be dealt with. Of course, women, unlike men, are given a choice by the Prophet to pray at home or in the mosque. But the Prophet was categorical in telling men “do not stop women from coming to the Masjid.” Friday prayers are also optional for women. But considering that Friday sermons are the only Islamic educational opportunity available to most women in the North America Muslim women should attend Friday prayers. This is especially important because we do not yet have a widespread tradition of female teachers, as is the case in the Muslim world. I am pretty sure Caliph Omar would have encouraged Friday prayer attendance by women if he was alive today in the United States, may God be pleased with him. Knowing both of these Masjids, their volunteer leadership, and the fact that women are on their boards, I don’t think either of them stops women from attending and participating. The first Masjid’s president did make an announcement twice in front of me inviting women to visit the new location to help determine the sisters’ space. I think, perhaps, need sisters taking these issues more seriously instead of accepting the current situation. In the second Masjid, I learned that some sisters prefer to pray behind a curtain. An easy solution could be to make a larger area where women who do not want a curtain between the men and women, as was the practice in the mosque of the Prophet, can pray. Behind them, women who are comfortable praying behind a curtain can do this. With lower donations as a result of donor chasing by the FBI, extra expenses for security and legal battles, which six or seven Masjids in the Chicago-area are going through, the last thing on the mind of Muslim leadership is women’s space. About 80 percent of the Masjids in the Chicago area do not have any permanent Imam. Volunteers like me are asked to offer the Friday sermon on a rotational basis. Almost all of these Masjids’ leaders are busy professionals who volunteer their time to run the community centers, schools and Masjids. Unless someone is pushing for something, things will continue as they have been. This is why I have come to the conclusion that the agenda of women’s space will not come to the forefront unless Muslim women take it upon themselves. It is time that sisters come together and provide leadership in clearly defining a Muslim women’s manifesto for change in mosques in North America. If these sisters are practicing Muslims, they will have a far higher level of success in demanding change and leading it. 2. One-third of Masjids’ Board of Directors should be composed of sisters, one-third of brothers, and one-third of people born in North America. 1. Invite the leadership of major mosques, as well as national and continental Muslim organizations to a closed-door dialogue with an equal number of Muslim women leaders present. 2. Give a deadline to all Masjids that do not have a space for women to allocate one in consultation with women. 3. If space is extremely limited and there is no cultural and ideological objection to it, then allocate time for additional congregational prayer for women lead by women as was done by Umm Waraqa with the Prophet’s permission when she lead her staff regularly in prayers in her own home as reported by Sahih Abu Dawud. (If thousands of women lead other women in prayers throughout Pakistan, it can be done in a mosque here as well). Shura (consultation) has been a way of life for Muslims (42:38). If our families and our communities are not run on Shura, open communication and proper representation, how will we grow?